Take a look at their lovely cards. 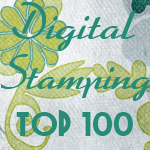 All the digital stamps are available at Karber Shop. Thanks for stopping by, have an excellent week! Awesome Creations Ladies. Your colourings are beautiful. Congratulations! You are going to love Berenice. Congrats ladies!! Looking forward to working and showcasing alongside you! Thank you Berenice!!! Amazing cards and coloring, ladies! So nice cards! Great job ladies.